My preschooler has a new Leap Pad (thanks, Grandpa) and it has several educational songs on it that I hear playing occasionally. The catchiest one goes, "Punc, punc, punc, punc-tuation!" The other day I heard my daughter walking around singing to herself, "Honk, honk, honk, honk-tuation!" I think I like her version even better. Phillip had a birthday and turned 100 this week. Or so he's been telling everyone. "You're only as old as you feel," I point out to him. Phillip's birthday was the most epic birthday fail ever, on my part. I mean, I remembered it, but that's about it. No gifts, no cake. Nada. November just snuck up on me and there were a couple of other things I was knee-deep in planning, and before I knew it his birthday was here. I have plenty more excuses, but I'll spare you the details. "Sorry you had the worst birthday ever," I said that night after putting the kids in bed. Phillip seemed genuinely surprised. "What? No, this was the best birthday ever!" "Why??" I asked, totally confused. "Because now I don't have to do anything for yours!" He proceeded to thank me for lowering the bar and we drank hot chocolate together. And that's what 12 years of marriage looks like, apparently. In my middle schooler's social studies class, they were supposed to think of what's necessary for a hamburger. The teacher's objective was to get them to say things like "farms" that were thinking a few steps further back than just ingredients like meat, lettuce, and buns. Therefore, the Big Bang is responsible for hamburgers. The teacher blinked at her a few times and said, "We don't need to go back to the galactic level." My daughter also reported that a friend who had social studies later in the day told her that the teacher prefaced the assignment by saying not to talk about the solar system. "Can I have one animal cracker before lunch?" (Holding up her outstretched hand) "How many is this?" At this point I asked what made her think that if I wouldn't let her have 1, 2, 3, or 4, I would say yes to 5. She considered my point for a minute and asked, "Six?" Our toddler is going through a funny phase right now when he gets mad. Instead of the standard "throw yourself on the floor and have a temper tantrum" move, he yells unintelligible gibberish at us while running away as far as he can get. 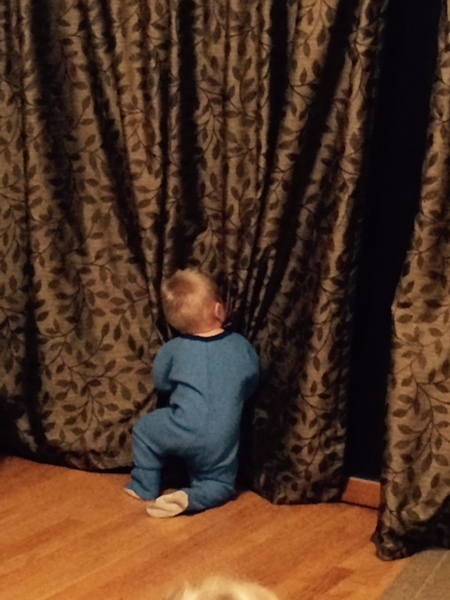 Last night before family prayer Phillip asked him to put his toy away, so he did what any self-respecting 1-year-old would do and hurled it to the ground, hid his face in the curtains, and growled at us whenever we said anything to him. May all your temper tantrums be this funny. I'm not that great at planning ahead (see take #3) but I've started thinking about Christmas. 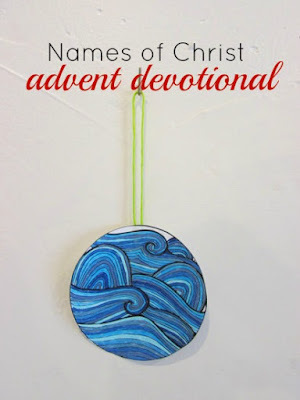 If your family, like mine, tries hard to find ways to connect your kids with the true meaning of Christmas, please check out my giveaway for two free copies of the Names of Christ Advent Devotional sponsored by Heidi at A Lively Hope. Each night of December, the kids get to make an ornament and there's a different Bible verse and discussion to have while they color. This is my first giveaway and I'd love it if you helped make it a success! Yay you for making Phillip's birthday the best ever!! Can we enter every day?? My seven-year-old has crazy tantrums right now, not fun. Toddlers should do all negotiations in the political world. Mine probably would have answered "God made it" rather than the big bang - but we homeschool so there is that difference in play. We love our LeapPad too - and that song has very stuck in the head capabilities. Way to lower the bar for all of us. I may cancel Christmas - nah, too extreme. I put my toddler/ preschool age kids in a corner in the kitchen to calm down when they have lost it. A couple days ago I told my 4 YO to clean up his toys. He calmly said, "No, but I'll go stand in the corner." This may be what you have to look forward to in a couple years. I can't stop laughing. Sometimes I'd choose standing in the corner over cleaning up too, if I had the choice! Freakin died over the Big Bang answer! I mean are you kidding get me? Genius! Of course! Now I realize how much I should be weaving that answer into everything. Thanks, kid. You can work pretty much anything back to the Big Bang, and I don't see why you shouldn't. I like honk-tuation better too and that calendar is awesome!! P.S. Tell your daughter I thought her analysis was pretty cool.